This is the best time of the year for beach lovers. In spite of the wacky weather that has been plaguing the whole world, summer is definitely here and people are hitting the beaches in droves. One popular destination in Europe is the Black Sea Coast of Bulgaria. Never mind the “black” name, this area offers some of the best places to sun bathe and have your fun in the sun! For calm clean waters and a gently sloping sandy bottom, head on over to the Northern Black Sea coast. More than these attractions, the beaches in the area also offer fine grained golden sand. 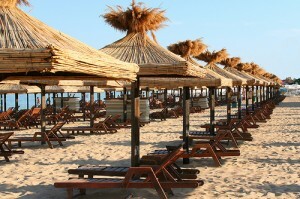 One of most popular resorts is the Golden Sands Resort (Zlatni Piassatsi). It is located in the Golden Sand National Park, which is about 18 kilometres from the city of Varna. Enjoy 3.5 kilometres of excellent beach, which is around 100 metres wide. That’s a lot of space to enjoy! Within the resort itself, there are almost 100 hotels, ranging from 2 stars to 5 stars. If you want to take a break from the sand and the water, you can go to the Blachik Botanical Garden, which is actually part of the University of Sofia. With over 3000 plan species, the garden is home to Europe’s second most important collection. Down south, you will be treated to a more rocky landscape. The water is just as warm, and the sand just as beautiful. The Southern Black Sea coast is also known for more modern amenities. Visit the towns of Elenite, Sunny Beach, Nessebur, Sozopol and see for yourself.